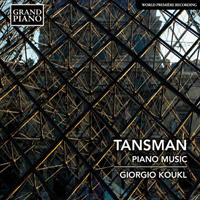 Description: We’ve had quite a few discs of Tansman’s short, refined, elegant and engaging piano pieces on various labels and he wrote so much that it’s really not a surprise that these are all first recordings. A third of the disc is taken up by the colorful pair of Pièces hébraïques of 1955 and the evocative set of ten pieces making up Visit to Israel (1955). Giorgio Koukl (piano).